When I lived in Tuscany, autumn’s arrival each year was heralded by a sudden flurry of activity in the countryside. The spell of summer’s lazy lull was broken by a revived energy as locals awakened from their sleepy trance eager to return to normal routine. One of the first signs of this risveglio was the annual wine harvest called la vendemmia. As if beckoned by the waving of a flag at the starting line, workers suddenly appeared in the lush yet rarely visited vineyards carpeting the hillside below my home to pick perfectly ripened clusters of grapes hanging on row after row of endless vines. There was palpable excitement in the air since it meant that those grapes would soon become our cherished local wine. This joyous time of vendemmia is welcomed each year in Tuscany like a sacred ritual with celebrations and symbolic dishes made only during the grape harvest. 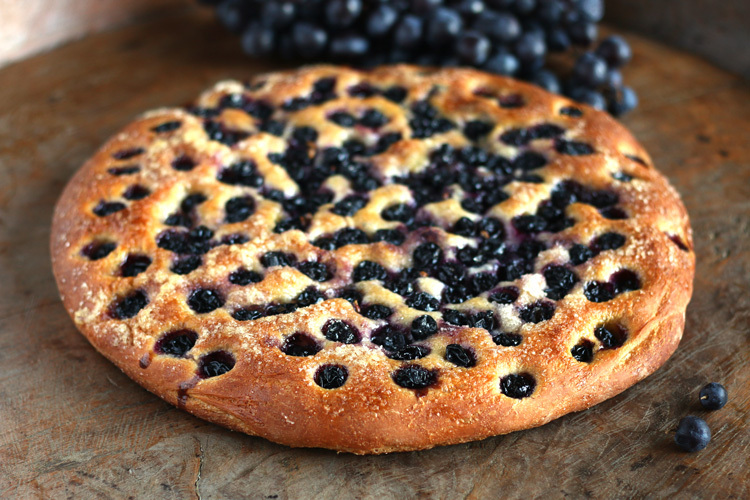 The most beloved is Schiacciata con l’uva, a Tuscan grape focaccia whose annual presence in bakery windows signals the jubilant start to a month long harvest season. The word “schiacciata” (pronounced ski-ah-chah-tah) means pressed or flattened and is the Tuscan name for savory flatbread otherwise known as focaccia in other parts of Italy. This sweet version, made of bread dough filled inside and out with sugar and juicy grapes that dot its golden surface like precious jewels, is a special treat to look forward to every year as much as the harvest itself. 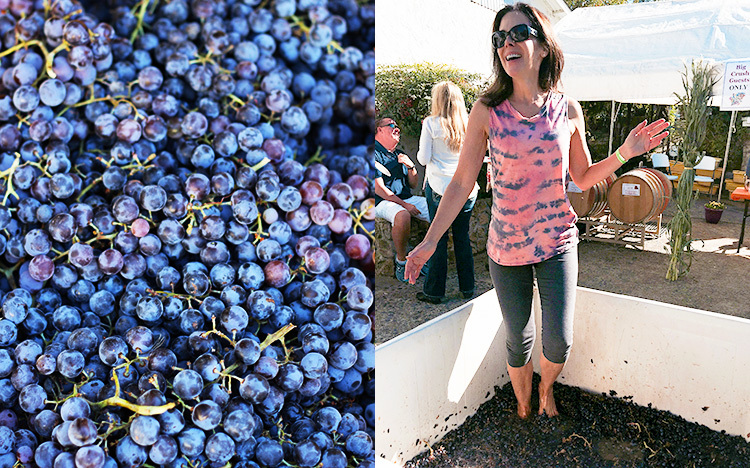 This year, instead of Tuscany, I celebrated the wine harvest in Northern California. 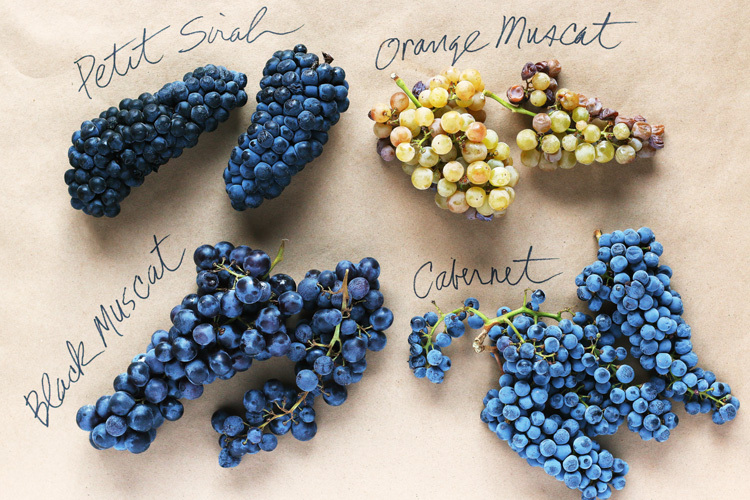 Like Italy, California is blessed with many wonderful wine producing areas and luscious grapes are in abundance. I take full advantage of these grapes to honor tradition by making this Tuscan grape focaccia and teaching it to my cooking students each year. Last month, I was invited to the “wine crush” in beautiful Amador County where my friend Paul has family owned vineyards that grow many different grape varietals to produce their excellent Sobon wines. There were wines to taste and bins of freshly picked grapes to admire. I even got to do some grape stomping and channel my inner Lucille Ball! But the best part of the weekend was receiving a bag full of grapes to use for my annual Tuscan grape focaccia. It felt like Christmas as I opened the bag and pulled out gorgeous bunches of grapes: tightly packed clusters of blue-black Petit Sirah, dangly Cabernet Sauvignon the color of Paul Newman’s eyes, huge purple Black Muscat and delicate, fragrant Orange Muscat. There were even some little clusters of raisins—grapes that had been naturally dried by the sun—to snack on while I reveled in my fortune. You see, using good grapes is important for this bread and in Tuscany those are rigorously freshly picked red wine grapes—with their seeds—to give this bread its intense berry flavor and distinctive crunchy texture. While schiacciata con l’uva was traditionally made with uva canaiola, a grape previously used in Chianti wine, it’s now being replaced with sweet uva fragola or strawberry grapes, known as Concord in the U.S. For my sweet focaccia, I chose the Petit Sirah grapes from my stash that were so small and round they looked like blueberries. Tuscan grape focaccia is a rustic snack traditionally made during wine harvest for farmer feasts called sagre contadine and the simplicity of its ingredients bear witness to modest origins: bread dough, olive oil, sugar and red wine grapes (uva nera). The yeasted bread dough recipe used for savory focaccia is enhanced with sugar and rosemary infused olive oil then let rise for an hour or so. It can be made the night before and refrigerated, which also improves the flavor and texture. Once the bread dough is ready, assembly is easy. The dough is divided and flattened or “schiacciata” (hence the name) into a baking pan like a pizza base, scattered with grapes and sugar then covered by another layer of dough and sealed around the edges. A second smattering of grapes and generous sprinkling of sugar covers the top layer of dough, then it’s drizzled with melted honey and olive oil and let proof while the oven heats. 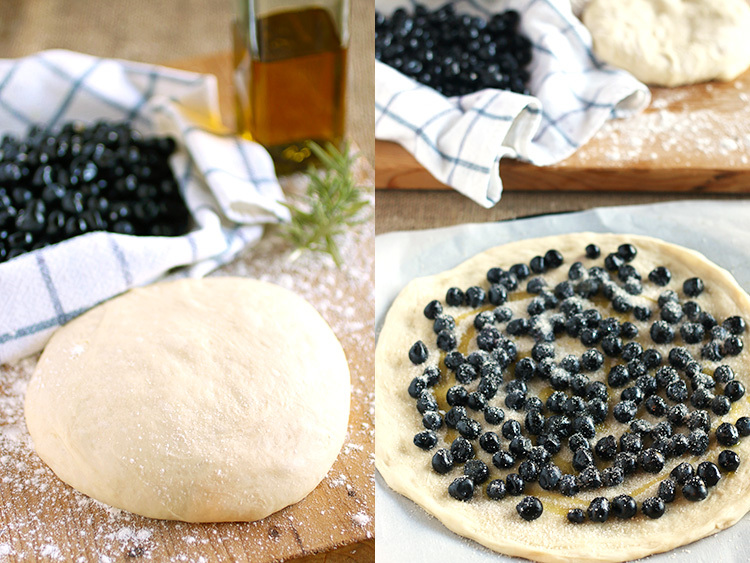 During proofing, the dough rises again, puffing up slightly so the grapes can be poked into the soft surface and create the dimpled effect so emblematic of focaccia. Then into a hot oven it goes where the bread crisps on the outside and the grapes and sugar melt into a jammy center on the inside that fills the focaccia with intense sweetness and flavor. 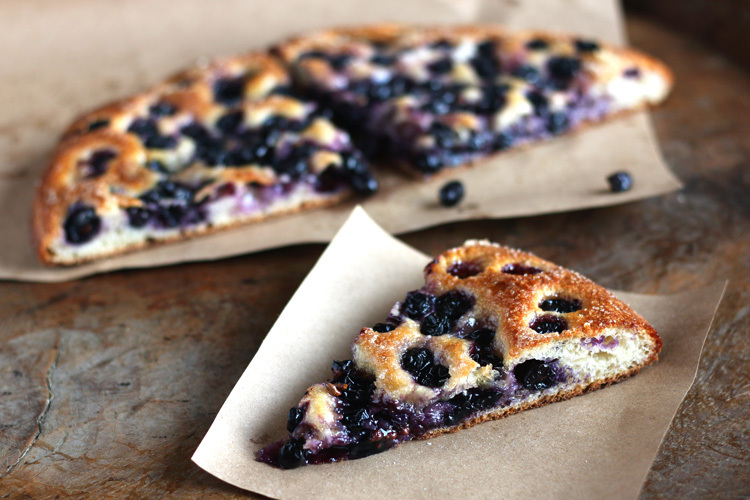 The result is a glorious flatbread crowned with soft, shiny grapes that adorn its golden surface like precious jewels. Once cool, (the sugary fruit center is molten!) the focaccia is cut into wedges or squares that show off its gooey filling and served as an afternoon snack or dessert. When biting into a slice, the crisp crust gives way to a chewy bread crumb laced with fruit preserves and punctuated by the surprise of grape seeds that give this bread its distinctive crunch. 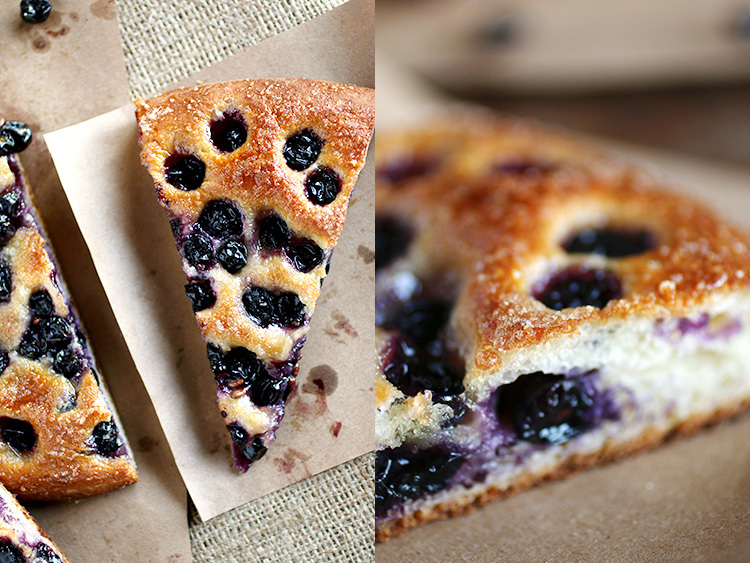 Tuscan grape focaccia epitomizes the simple pleasures in life and celebrates wine harvest in a uniquely delicious way. So, even if you didn’t go to Tuscany for the vendemmia, find some concord grapes at your local market and enjoy this special treat! Line two 12-inch round baking pans or one 13 x 18 sheet pan with parchment paper or grease well with olive oil. Heat the olive oil and rosemary until just warm. Cool to room temperature then remove and discard rosemary. In a small bowl dissolve the yeast and honey in ½ cup of the warm water. Let stand until foamy on surface, 5 to 10 minutes. If mixture does not foam, discard and begin again with fresh yeast. Sift together flour, sugar and salt in a large bowl or mound on a work surface. Form a well in the center of flour and pour in the yeast mixture, rosemary infused olive oil and 1 cup warm water. Stir with a wooden spoon until ingredients are incorporated and a dough forms. Turn dough onto a floured work surface and knead by hand for 10 minutes until soft, smooth and elastic or in a stand mixer fitted with dough hook for 6 minutes until dough winds up the hook like a cord, adding more flour if too sticky. Form the dough into a ball and place in a large bowl that has been rubbed with 1 tablespoon olive oil, turning once to coat both sides with oil. Place a damp kitchen towel or plastic wrap over the bowl and set aside in a warm, draft free place to rise until dough doubles in volume, 1 to 2 hours. Dough can be made the night before and refrigerated then brought to room temperature before stretching. Punch down the dough then turn onto a floured work surface and divide into 2 balls, one slightly larger than the other. Divide the larger ball in half equally then, using floured hands, flatten and stretch each piece into two 12-inch circles about 1/4-inch thick (or stretch the entire ball into a rectangle to fit the sheet pan). You can also use a rolling pin to roll out the dough. Line bottom of baking pans evenly with the stretched dough then distribute 2/3 of the grapes over top in one layer, leaving a 1-inch border around edges. Sprinkle the grapes evenly with a little more than half of the sugar and drizzle lightly with olive oil. Stretch the remaining dough in the same manner and place over the grapes to form a top layer. Seal the edges well by pinching together then gently press down on the top layer with your hands to crush some of the underlying grapes. 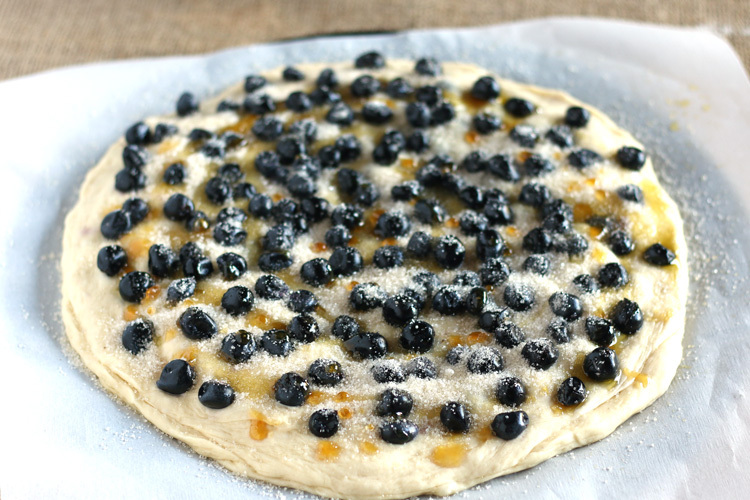 Scatter the remaining grapes over top, poking them lightly into dough. Sprinkle with the rest of the sugar then drizzle with melted honey and olive oil. Set aside to proof for 30 minutes before baking. Preheat oven to 375°F/190°C. Bake in the center of hot oven for 30-35 minutes until golden and fragrant. Cool completely before serving cut into wedges or squares. Best eaten the same day but can be refrigerated and warmed the next day. Freezes well.